Shoulder flexion (reaching overhead) is an essential motion in all activities of daily living. Beyond that, if you are working handstands, bridge flexibility or straight-arm inversions on the fabrics - you need more than the "standard" amount of motion. As mentioned in the blog post about the shoulder, there are dozens of muscles that contribute to - and restrict, shoulder flexion. While the stretch detailed in this post isn't the only one that can be done, it is one of the "shoulder mobility" tools that should be in your toolbox. The muscles/structures addressed with this stretch include: the latissimus dorsi, the serratus anterior, the anterior capsule of the shoulder/fascial attachments, and the long head of the triceps brachii (because of it's origin on the infraglenoid tubercle of the scapula). The latissimus dorsi runs from the thoracolumbar fascia and the thoracic spine to the back of the humerus. It's fibers align such that it assists in extending the shoulder (arm behind you), and adducting the shoulder (bringing it tight against the side). When tight, it can restrict overhead motion (both forward and to the side) and cause shoulder pain and problems. What I have always found really fascinating is that because the latissimus dorsi originates in the low back, alignment problems in this area can be the driving problem in shoulder pain! (So basically your low back and hip pain are likely related to your shoulder pain). This is where the assessment and treatment of a skilled manual therapist can be essential as they are able to relate pain/dysfunction to areas in the body that might be overlooked by another professional. The triceps brachii has 3 heads: the long head, the medial head and the lateral head. The medial and lateral head originate on the humerus (upper arm bone) and run across the elbow into the forearm. As such, they are primary extenders of the elbow (aka: they help to straighten the arm). The long head however, originates on the scapula, and also helps to extend the shoulder (similar to the latissimus dorsi - but with less force). Because of this, when it is tight, it can be it harder to reach overhead when the arm is bent (think of combing your hair, scratching the base of your neck or reaching up and behind you to grab your leg to pull into a needle scale). 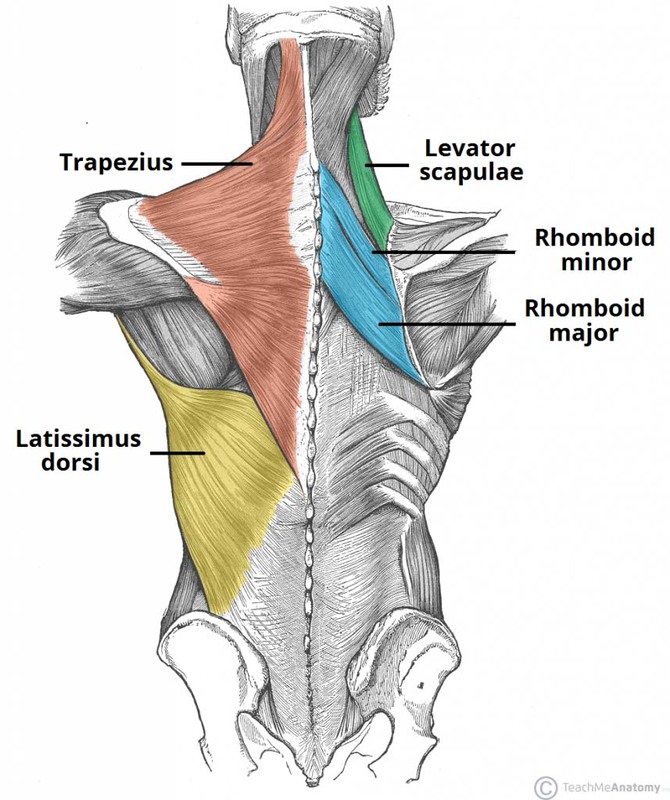 As the latissimus dorsi "overlaps" the serratus, tightness or issue with one can lead to problems in the other. The serratus anterior runs from the sides of the 1st-8th ribs and inserts into the medial (near the spine). It helps to anchor the scapula to the thorax and is one of the muscles that moves the scapula during arm motions to allow for the dexterity we enjoy in the upper extremity. In many shoulder problems, this muscle is dysfunctional - meaning that it can be tight, weak or poorly functioning. Re-educating the serratus and restoring normal scapular motion is a complex process, and requires a lot more than the overused cue of "shoulders back and down." (But that's for another blog topic in the future). Even so - stretching it is a great place to start when you're on your own. What it stretches: the latissimus dorsi, the serratus, the long head of the triceps brachii and perhaps some of the fascia along the anterior shoulder. Elbows on a counter/high table, palms together. Stand in a lunge with the abdominals engaged (this protects the back and ensures that the muscles being stretched are not actively supporting your body weight). Press the chest down toward the floor (think of squeezing the shoulder blades back during this). To increase the stretch, bend the elbows more or bend more at the waist. Hold for 30-40 seconds; do 2-3 repetitions. What it stretches: This variation does less for the long head of the triceps brachii (as the arm is straight). It still addresses tightness in the latissimus dorsi & serratus, as well as the anterior fascia on the front of the shoulder. This variation is excellent for overhead athletes that hang often - especially those that hang and do straight-arm inversions (aerialists, gymnasts, rock climbers) to ensure that the muscles involved don't lose length while they are gaining strength. Hands on a low bar, high counter, or while holding the aerial fabrics (at about shoulder height). Stand in a lunge with the abdominals engaged (this protects the back and ensures that the muscles being stretched are not actively supporting your body weight). To increase the stretch, exhale and push the sternum forward slightly. Happy Stretching! And have a great Labor Day weekend!